Governor Kim Reynolds today said “a perfect storm” of weather conditions in the region has caused the catastrophic flooding along the Missouri River corridor. “It has compromised every single levee from Council Bluffs all the way down to the Missouri border,” Reynolds said. Reynolds briefed statehouse reporters this morning after touring flooded communities in northwest and southwest Iowa over the past two days. Reynolds will be in Omaha late this afternoon to accompany Vice President Mike Pence to visits with local officials, flood victims and a fly-over some of the area. Reynolds flew over parts of the Missouri River corridor yesterday. Reynolds has asked for the early release of federal funds to rebuild flood-damaged roads. She’s also talked with the U.S. Ag Secretary to discuss what options farmers may have if stored corn and soybeans have been flooded — as that grain is uninsured. “All of our bins and elevators are full of grain. This is typically the time they start to move it, so tremendous loss there as well as livestock,” Reynolds said. Some livestock confinements have been flooded, so officials are discussing how to properly dispose of the animals. Reynolds has declared 41 of Iowa’s 99 counties disaster areas and she warns as Minnesota goes through the thaw cycle, other rivers — especially the Mississippi — are going to rise. Reynolds said she has “no doubt” western Iowa areas that have been hard hit by flooding will be declared a federal disaster area. The governor’s emergency management director says the state has likely qualified for federal disaster assistance for damage to government-owned facilities, including roads and bridges. 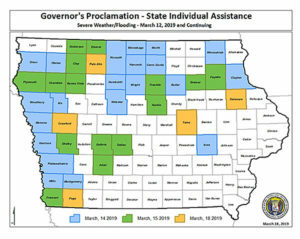 Assessments of damage to individual property owners can’t be made until the flood waters recede — and those assessments will determine if individual Iowans will get disaster assistance as well. 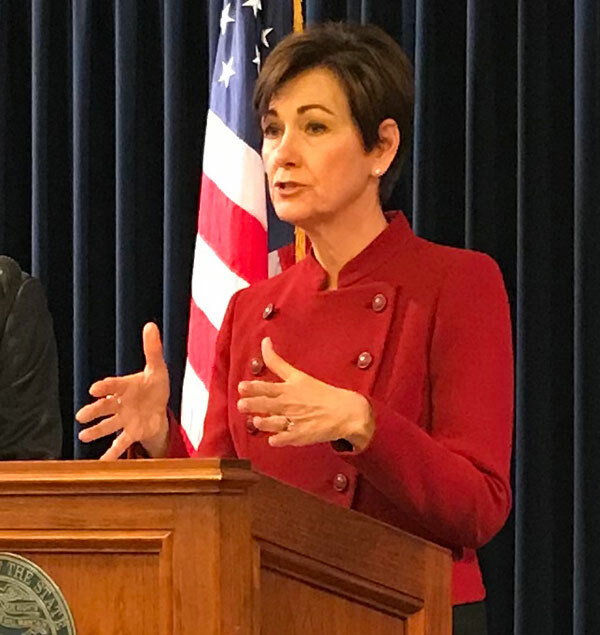 “We want to see what we can do to expedite the funding to make sure we can get that in place and start to alleviate some of the concerns and questions that communities and farmers and Iowans have all across the state,” Reynolds said. 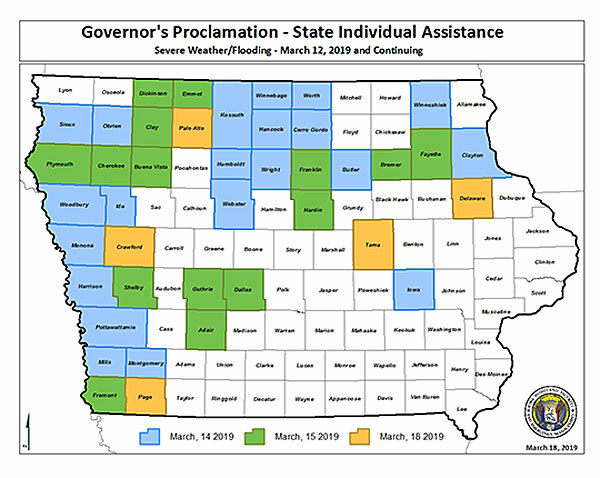 State officials are providing some immediate paperwork relief to small businesses in the affected counties — a 30 day extension on filing sales and use taxes as well as income tax withholding. Audio: Governor Reynolds’ news conference. 31:00.